As Peshawar Zalmi came out to chase, the debutante Mohammad Musa did not take long and removed Kamran Akmal in his first over, leaving the Men in Yellow under pressure at 18/1 in three overs. As his tail was up after taking the first wicket, he also hunted Dawid Malan in his next over. Faheem Ashraf joined Musa in the riot and got the better of Imam Ul Haq, denting Peshawar Zalmi’s progress towards the chase further. the left-handed batsman scored 18 (16). 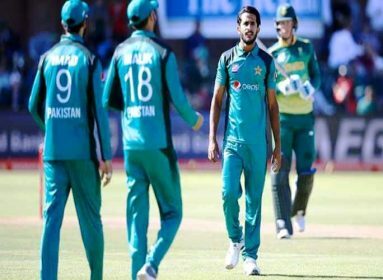 As Umar Amin and Liam Dawson were looking to get on course, Islamabad United’s ace, Shadab Khan struck in shape of Amin, who scored 14 (20), who had a tough time in the middle. The leg-spinner continued his inspiring bowling in the game and went on to take Dawson’s wicket as well. 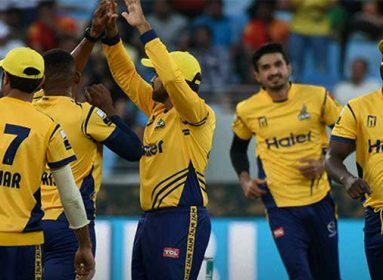 However, the game seemed to be over for Peshawar Zalmi, the Caribbean duo of Kieron Pollard and Darren Sammy went on guns blazing. The strong all-rounder, Pollard scored a half-century on 21 deliveries with the help of five 6’s and three 4’s. However, he fell soon after his 50. On the other hand, Darren Sammy stuck in the middle for his team, but could not last long. At the end, there was an effort from Wahab Riaz to take his team to home as Peshawar Zalmi needed 19 runs in the last over, but Riaz could only manage a six on the first ball and then got out on the second, and also picked wickets of Umaid Asif and Hasan Ali on the third and fourth delivery respectively to seal the win with a hat-trick. 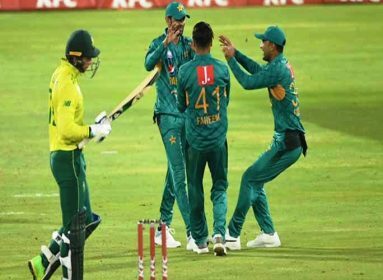 Mohammad Musa and Mohammad Sami took three wickets each in the match, while Faheem Ashraf took two and Shadab Khan and Samit Patel struck once. Earlier, Islamabad United were invited to bat after Peshawar Zalmi won the toss. With a new opening combination of Luke Ronchi and Sahibzada Farhan, the reigning champions had respected beginning to their inning with 30 runs in the first four overs. However, the young pacer of Peshawar Zalmi, Sameen Gul managed to get rid of the dangerous wicketkeeper-batsman in the fifth over after he scored 21 runs off 14 balls. Islamabad United had given a chance to England’s veteran batsman, Ian Bell, who made debut his PSL debut. He and Farhan looked stuck at the crease and were unable to score freely. As the young opening batsman looked to increase the scoring rate, he top-edged one and found the fielder in the deep. He scored 15 (18). Soon after the loss of Farhan, Kieron Pollard managed to remove the talented left-handed batsman Hussain Talat for a duck, leaving United reeling at 49/3 in 8th over. 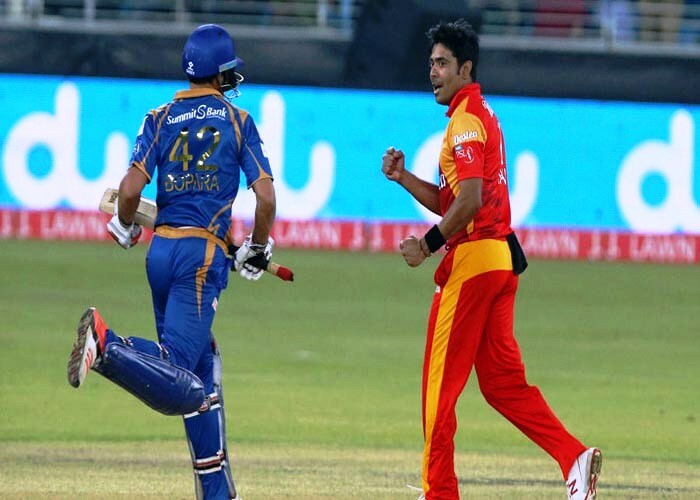 However, the pair of Bell and Cameron Delport looked to sail the sinking ship of Islamabad United and contributed 50 runs together in 6 overs, which helped the cause. However, as the partnership started to look threatening for Zalmi, the man in form, Hasan Ali removed Delport on 29 (18). Asif Ali looked threatening during his brief display, hitting two towering sixes, but he played too many shots and eventually got caught in the deep, scoring 13 off 5 balls. Islamabad United’s lower middle-order failed as Faheem Ashraf, Shadab Khan and Samit Patel scored 2, 6 and 5 runs respectively which restricted them to only 158/9.